We know that motherhood is a never-ending cycle of learning new things – things you never anticipated would even matter – so it’s always nice when someone who has ~ been there and done that ~ can give you a few tips on what to expect, when to expect it, and how to keep everything going smoothly (at least for the most part) when it is time. Whether you are expecting and are trying to study up on a few things before your new little one gets here, or you are in the midst of the action and need a few little pointers, you’ve come to the right place. Transitioning from crib to bassinet is often a stressful and nerve-racking time for both you as a new mum and for your little one. To help make the transition easier on the both of you, we’ve set up a little guide below. Keep reading to learn more about when to start the transition and to pick up a few little tricks to help you out along the way. Of course, every baby is different, so it’s difficult to give an exact age at which you should begin transitioning your babe from their bassinet to their crib (and thus from your room into their nursery). Typically, it is around the 6-month mark, but depending on your baby’s size, weight, and movements it can end up being earlier or later than that. Rather than basing the decision to transition solely on your little one’s age, it is better to base it on their development. There are a few major signs that indicate that they are nearing the stage of being ready to transition to a crib. If your little one is growing like a weed and they are starting to look a little cramped in their bassinet, it’s probably time to find them some new accommodations. It’s not going to be fun for anyone if your little one is stuck sleeping in a bassinet that is too small for them. If they are squished and uncomfortable, chances are they won’t sleep throughout the night – and that means you probably won’t sleep throughout the night either. This milestone is an exciting one – but it also means that maybe the bassinet is not the safest place for your little one to be sleeping anymore. Once they reach the point where they are starting to roll over or sit up, the bassinet can be dangerous. It only takes a few moments for a curious baby to pull themselves up and (accidentally) over the edge of the bassinet. Too much movement means the crib is definitely the safer option. As with any part of parenting (and life in general) there are bound to be some hiccups. To help cure those hiccups, we thought we’d give you some tips on how to make the transition easier on both you and your little one. Start off by putting your baby down for naps in their crib. After a couple weeks of afternoon naps, they should be used to the crib enough to give the real thing a go. This is mostly for your own sanity – transitioning your baby into another room can be stressful. You are so used to having them in sight that you worry when they are not – it’s normal for new moms to have a bit of separation anxiety. A monitor can help keep you ensured that your little one is doing just fine down the hall. Often our little one’s will often go through some type of separation anxiety at the beginning of the transition. I mean, they are used to sleeping next to you everynight and all of a sudden you aren’t there – it’s understandable. 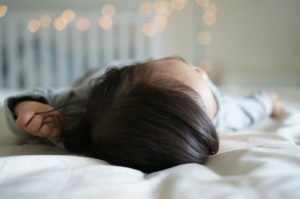 To minimize this, rather than going cold turkey (aka putting them down in the crib and leaving), try lingering in the room until they settle, get comfy, and start to nod off. Of course there is no black or white way to approach motherhood, and this situation is no different. Take these tips to heart, but remember that no one knows your baby like you do. Do what feels right for both of you, and you should make it through the transition just fine.